The small country of Greece has had an impact on food for thousands of years! With its rich history and perfect location for a variety of fruits, vegetables, and greens – Greek cuisine has become very popular with the rising realization of its health benefits as part of the Mediterranean. Traditionally Greek food has an emphasis on fresh salads, vegetables, poultry, lamb, fish, olive oil, lemon, oregano and salt/pepper. Greek cuisine’s simple seasonings tend to make it more important for foods to be fresh and of high quality so the food itself is the flavor rather than heavy sauces or condiments that are popular with other foods. At Taste and Sabor, a focus is on higher quality foods that are fresh and simply seasoned for a tastier, healthier food profile. Gyro is a traditional Greek food, consisting of poultry (chicken) or meat (pork, lamb) that is cooked on a vertical rotating rotisserie. It it usually made into a sandwich by adding lettuce, tomato, onion, tzatziki sauce (strained yogurt, mixed with cucumbers, dill, garlic, salt, olive oil and vinegar or lemon juice). The version just containing meat or chicken is usually called Souvlaki and is served on a pita plain. 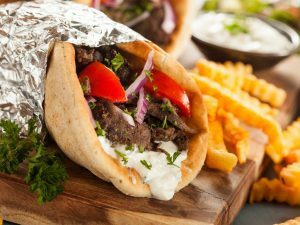 Gyros became popular in the United states during the 1970s, particularly in Chicago and in Astoria, Queens (part of New York City) in the ethnic Greek neighborhoods. Today’s the word gyro is known globally for the Greek food and enjoyed by millions! Greek salad today enjoys strong popularity as interest in the Mediterranean diet continues to grow. A typical Greek salad consists of romaine lettuce, tomatoes, onions, peppers, feta cheese, olives, olive oil and is dusted with oregano, salt and pepper. Some variations will include grape leaves and anchovies. Today Greek salad can be found at just about any establishment that serves salad! 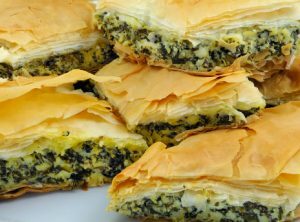 Spinach pie’s is a traditional Greek food that has also enjoyed a popularity boost in recent decades. A spinach filling (made of chopped spinach, feta cheese, onions, egg and seasonings) and encased in a flaky filo pastry dough that makes it hard to resist. Popular with vegetarians and non-vegetarians alike, it makes eating Spinach a lot easier for those to avoid it! Some versions can be made without eggs or diary for a vegan version (sometimes also made in observance of religious holidays in Greece). There is no English translation name known for this popular lasagna look alike dish. The Taste & Sabor version is made with ground beef, eggplant, zucchini, potato, onion, garlic, tomato, spices, béchamel (a flour based sauce). It is a very filling dish and is popular around the Mediterranean with many local versions.